Wearing an aquamarine engagement ring is like wearing a piece of paradise. Naturally resplendent in shades of the sea, aquamarine elicits the restful calm of a day spent on a Caribbean beach. Mesmerizing, captivating, alluring--perfect words for this exquisite member of the Beryl family. Color is king in engagement rings this season. More and more brides are choosing to take a step toward the contemporary, and one of the best ways to do this is to choose a central stone with some color. The cool and gentle tones of aquamarine complement nearly every color on the spectrum, making them an excellent choice for the ring you will wear nearly every day for the rest of your life. 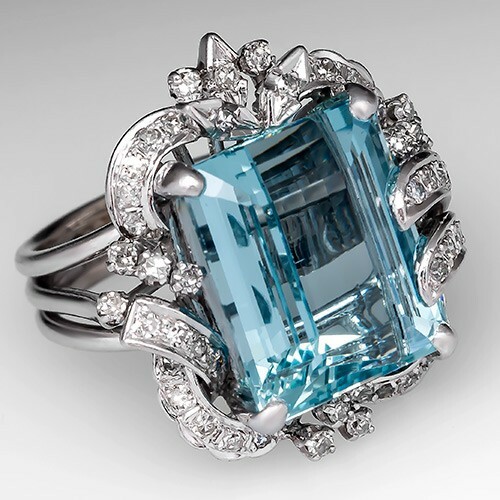 According to Dr. Lance Grande, Senior Vice President and Head of Collections and Research at The Field Museum, "There is no gem that rivals the cool sea-blue color and clarity of a high-quality aquamarine." He goes on to explain that natural aquamarines are typically free of noticeable inclusions, making them perfect for the bride who wants to make a statement. According to the U.S. standardized birthstone list, aquamarine is the birthstone for the month of March. If your birthday is in March, or if your future spouse's birthday is in March, choosing an aquamarine center stone for your engagement ring is a touching gesture of honor. While not the most romantic reason for choosing such a beautiful stone for an engagement ring, your budget will play a hefty role in how you make your final decision. 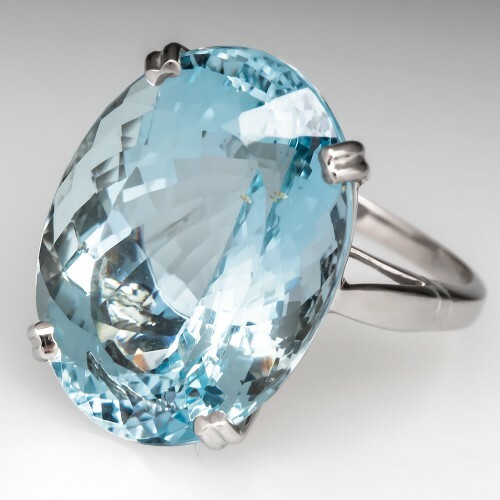 Considered a semi-precious stone, aquamarine prices out considerably less than the more traditional precious stones, such as diamond, ruby, and sapphire. An aquamarine center stone affords you the opportunity to purchase a larger stone with higher clarity, a real statement piece. If sparkle is important, you should have no trouble including the sparkle of diamonds by choosing a diamond-paved band or diamond accent stones. Bottom line, by choosing an aquamarine your dollar will go farther. Aquamarine is a somewhat durable stone suited for daily wear. Since your engagement ring will be subjected to the wear and tear of your daily life, it is important to choose a stone that will stand the test of time. A gemstone's durability is measured primarily by its score on the Mohs Scale of Hardness. 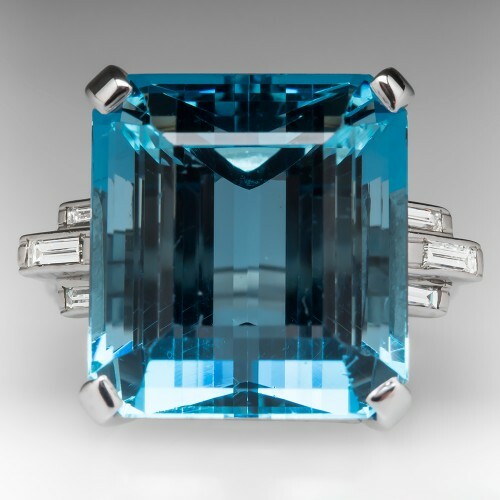 As a member of the Beryl family, aquamarine has a rating of 7.5-8 on the Mohs Scale. This makes it strong enough to resist scratching and breakage with every day wear, an excellent choice for an engagement ring. 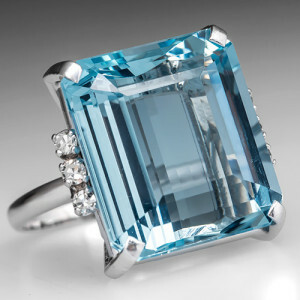 A large cocktail style aquamarine may not be suitable for every day wear however.